Chavanga Fish Blog: Kola salmon fishing. Kola – 3 river salmon tour. Kola salmon fishing. 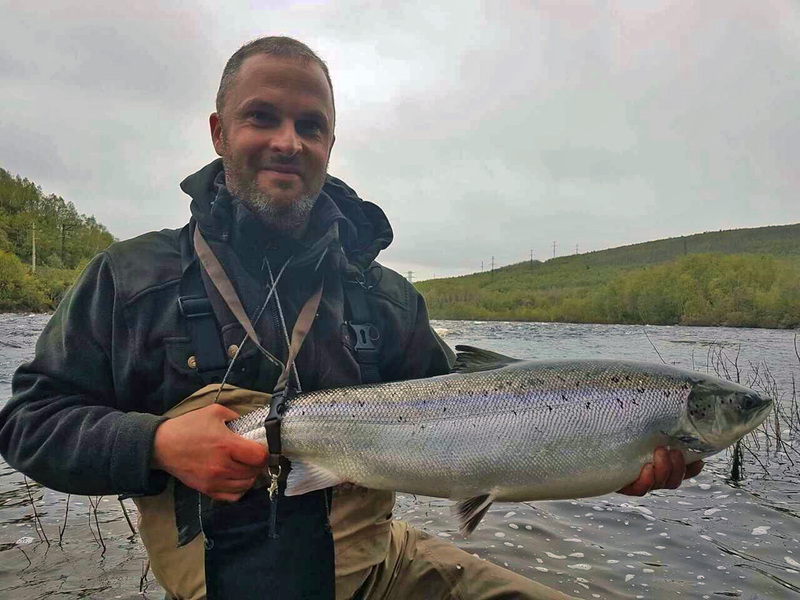 Kola – 3 river salmon tour. Salmon fishing at the Kola river is interested for anglers who want to catch a big salmon. Kola got its reputation for big salmon, which comes into the river. There are benefits to be found in a relatively convenient location of the river, near the airport. This greatly simplifies the way to the river. There are also disadvantages. These include extremely high fishing pressure, which is associated with narrow-located for the big city. You can also note the extremely irregular running salmon and unpredictable fishing results. But the chance to catch a very large salmon is worth it to try and catch him. Indeed, for many years the river gives us that opportunity. Despite the proximity of Murmansk and other settlements in the Kola River there are enough big fish. We must realize that, contrary to naive advertising is not easy to catch a really big fish. You'll need all your skill and the help of our guides. We are pleased to inform you that in addition to the possibility of meeting with a large salmon, we can offer you accommodation in a really comfortable environment for real-life, not overpriced at 10 times. The owner of the Kola rive is the goverment organization - Murmansk Ryb Vod. There is a verbal agreement between the parties, who are engaged in the fishing business organization, whether to use different parts of the river, not to create large clusters of fishermen. Valid license KOLA - 3 gives you the right to catch salmon in any part of the river, including all pools near Deer Camp. Kola part 3 has near 40 km in length. One of the advantages of the site Kola - 3 is that you are invited to catch the lower part of the site. Its length is 17 kilometers. The fishing site begins from the Joint Pool at the confluence of the Kola and Kitsa river. Salmon of two rivers run and stop to stay in this part of the river. Therefore, it is much more susceptible to the adverse effects of the weather or the state of the river. Here below you can find a brief information on the organization of such tours. We can do a combined tour. You can visit some of the rivers - for example - the River Kola and then go fishing to Kitsa or Ura. I would like to discuss with you another option of salmon fishing on the Kola Peninsula in Russia. The only airport here - is the airport of Murmansk . Almost every angler who comes here from Europe or America is forced to spend a day or two or even three days to the waiting helicopter or other transport to get to the river. Many anglers believe that it makes no sense to spend these days in the hotel, if you can spend that time fishing. So we want to offer you the option , which includes one, two or three full fishing days . The organization of this option does not differ from the standard version . You will be met at the airport, taken to the hotel , settled . Will be taken in the morning on the river. Guide will work with you , at your disposal - car and boat . You will be provided with food and other services , which are inherent in the standard program of 7 \ 6 days. Price is determined by the number of fishing days and the number of nights at the hotel. I hope for many anglers this option looks interesting . ( Murmansk city) and back. It is the same for all types of tours. Anyone can come in their own cars. The hotel has a guarded parking. a la carte restaurant, the menu is made on the week and posted on the 1st floor. in agreement with the client served lunch on the river. Dining maybe 3 or 2 times a day. Fresh fruits are available on the table constantly, tea and coffee set too. Alcohol is not included in the price. not included in the price. At the request of fishermen dinner can be served in the bath. (from 23.00-05.00 June, July), paid separately. the first medical aid. A good insect repellent available. is a 100% chance to catch a big fish spring. For your disposition salmon areas from the Kola- Kitsa river connection, Joint Pool, Go;d Pool, Sirius, Pomp, Loparskaya, Air Bridge, Cementary Pool, No Name Pool, Monica, Tube, Mirrow and to the Salmon Net Pool. 1st day. Meeting, accommodation, fishing on a home pool. 2- day. Rafting on the site Kola-3. 3- day. Fishing on the Kola-3, "Monica pool." 4- day. Fishing on Kitsa, Bridge pool and fishing dawn stream sites (3 km). 7- day. Fishing on the Kola-3, alloy or 1-Kola or Ura. Some changes in terms are possible . Delivery to the site 3-Kola organized by minibus. The distance from the bus parking to the river is only 100-200-300 meters . .
7. Guide has your individual licenses for all days of fishing and presents it for inspection. Part of our guides are freelance inspectors. We have tried to keep the old price of our tour. May ................. 1300 euros all inclusive. June ................. 1850 euros all inclusive. July, August ...... 1650 euros all inclusive. September ........ 1450 euros all inclusive. October ............ 1250 euros all inclusive. Extras: rental gear and equipment, sauna, bar, a visit to Murmansk. Registration, delivery from the airport of Murmansk or train station Kandalaksha and back. 3 meals a day during all tour, services of the cook. Transport for the movements on the river (off-road cars, the cross-country vehicle, boats, a minibus). Cost of tickets to the meeting point (airplane tickets). We work on a prepaid basis, it is 30 - 50% of the cost of the tour and ordered transferred to the account of the company. After we have received your confirmation is sent. The second part of the cost is paid by place of residence. With regular customers - a confidential settlement system.